Description: Alexa Hollen is a fighter. Forced to disguise herself as a boy and serve in the king's army, Alex uses her quick wit and fierce sword-fighting skills to earn a spot on the elite prince's guard. But when a powerful sorcerer sneaks into the palace in the dead of night, even Alex, who is virtually unbeatable, can't prevent him from abducting her, her fellow guard and friend Rylan, and Prince Damian, taking them through the treacherous wilds of the jungle and deep into enemy territory. The longer Alex is held captive with both Rylan and the prince, the more she realizes that she is not the only one who has been keeping dangerous secrets. And suddenly, after her own secret is revealed, Alex finds herself confronted with two men vying for her heart: the safe and steady Rylan, who has always cared for her, and the dark, intriguing Damian. With hidden foes lurking around every corner, is Alex strong enough to save herself and the kingdom she's sworn to protect? Defy is what I would classify as an action romance. Emphasis being on the romance because while there is heaps of action, fighting and adventure going on there quite a bit of romance that takes ups the majority of the book. It even includes a love triangle so if you don’t like that sort of thing than this book might not be for you. If you are anything like me and like potent combination of adventure and romance than Defy will definitely be a delight. 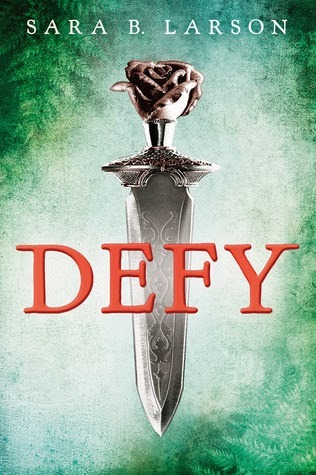 Defy reminded me a lot of Alanna the Lioness by Tamora Pierce. Like Alanna the premise centres on a young female protagonist who pretends to be a boy whilst fighting for her kingdom and freedom. Alexa’s story is one that pulled me in right away. Right from the get go, I wanted to know more about her and what was going to happen to her. Sara B. Larson weaves a tale about a girl who changes an entire kingdom. Alexa has been forced to pretend to be a boy and join the King’s army in order to survive. With remarkable fighting skills, she ends up as one of Prince Damian’s guards. After a battle gone wrong Alexa, fellow guard Rylan and Prince Damian find themselves kidnapped by a sorcerer. Not everything is as it seems or that simple as everyone seems to have an agenda. As secrets come to light Alexa has to decide whose side she’s fighting on and where her heart lies. The story keeps constantly moving as we are introduced to all the players in this game. Larson does a great job of keeping the events interesting and creating enough suspense that you want to know what happens next. The setting is also lush and dangerous. It’s set in the jungle, which is a welcome change from most fantasy novels being set in a forest. Poor Alexa is put through a lot and she always manages to survive because it’s who she is. She is a fighter and a survivor. She is loyal to her friends, family and fellow guards. Larson realistically portrays Alexa’s identity crisis. She has been pretending to be a boy for so long that when the truth come out she doesn’t quite know how to behave. All though she is a little bit too trusting and rough on the edges by the end of the book she really comes into herself. She figures out who she is and what she wants becoming stronger for it. I’m usually wary of love triangles unless they are done right but this one didn’t bother me so much. Alexa is literally stuck between the two love interests and it makes for some awkward scenes and comedy. Lets just day that Larson writes perfect awkwardness well. Prince Damian was a bit of an enigma. . He has lots of big secrets. He is really sneaky in this book but the reasons for his secrets are genuine and he wants the best for his kingdom and his people. Damian’s secrets and lying is definitely an obstacle for him and Alexa. I wanted to shake her at times for trusting him but was glad that their trust issues were raised and red flagged. Rylan was a very loyal loving best friend who was there for Alexa when she needed him. Defy was an enjoyable read, but it was not a perfect book. Like with anything there were parts of it I really loved like the romance and action. On the hand I thought there was a lot of potential in this book that hasn’t yet been explored. It felt like the Defy was laying a lot of groundwork for some massive adventure in the second book. There were also plenty of opportunities that could have been explored more such as the political plot, which there was not a lot of in this book. There was also a missed opportunity for same gender relationships to be explored considering Alexa was pretending to be a boy. I was also not a fan of the breeding houses, despised them more like and didn’t quite believe that they were necessary. Also a lot of people seem to know Alexa’s secret. Defy is an enjoyable action romance. The ending opens up a whole new story that can be told in this world and I can’t wait to see what happens next.